The harnessing of electrical energy is one of mankind's greatest achievements. English chemist John F. Daniell was credited with developing the first "primary" cell, even though his work was a continuation of the research carried out in the late 1700's by Italian scientist Alessandro Volta. Volta's battery (or galvanic cell), called the "Voltaic Pile," consisted of silver and zinc discs separated with cardboard and soaked in salt water. Daniell's primary cell was more efficient, but French physicist Gaston Plante took this discovery one step further in 1859 with the invention of the lead-acid storage battery. The modern "dry cell" battery was developed just a few years later by another Frenchman, Georges Leclanche. By 1900, 38% of pleasure cars sold in the U.S. were electrically powered, 22% gasoline-driven, and 40% steam-driven. But steam had had its day, and the wealthy showed an overwhelming admiration for the quietness and simplicity of the electric cars. The French BGS Electric Car held the world's distance record on a single charge - 290km in 1900. Electric-powered taxis plied the streets of New York, but country trips were a constant problem. With no power source at their country estates to recharge the batteries of their carriages, the wealthy found electric transport had its limitations. The development of the automobile starter motor by Charles Kettering in 1911 ended the electric vehicle's hold on the market place. The year 1912 was the high point for electric vehicles in the U.S. with almost 34,000 cars, trucks and buses registered for road use. This trend for electric vehicles went downhill from here with only limited use in specialized commercial applications. The 1967 GM Electrovan was one of the most famous examples of the fuel cell electric vehicle. Using NASA technology, GM engineers developed a means of using a non-liquid membrane and platinum electrodes which acted as a catalyst in the presence of hydrogen and oxygen. It was effective, but costly. Electric vehicles even made it to the moon with the Apollo 15, 16 and 17 missions. Despite this success, the EV has continued to be plagued with problems that restrict its use, namely cost, range, weight and recharging time. Solutions to these problems are within our grasp, and are presently being implemented in the new electric vehicles rolling off the assembly line. Photovoltaic cells are constructed of semiconductor materials which can absorb light and convert it to electricity. The term itself is derived from the Greek "photo" meaning light, and "voltaic" from Alessandro Volta. The most commonly used semiconductor is silicon (sand), one of the most abundant materials on earth. The manufacture of an active silicon cell, at its simplest level, involves growing a crystal of silicon from reservoirs of molten silicon. Silicon in its pure form is somewhat poor in its ability to conduct electricity, therefore it is necessary to add small amounts of impurities. The type of impurity used in this "doping" operation is dependent on whether we want the semiconductor to conduct positive or negative charges. As a rule, phosphorous will be added to produce a silicon that will conduct negative charge (electrons) and is referred to as an n-type silicon. The addition of boron to the silicon will produce the opposite effect, conducting positive charges (hole), and is referred to as a p-type silicon. Once these two types of silicon have been produced and are layered into a single cell, a junction is formed called a p-n junction. It is at this junction that a voltage potential is developed, similar to that at the terminal of a storage battery. When sunlight strikes the cell in the vicinity of the p-n junction, each photon generates an electron and a hole. The electron and hole move apart; this movement of charge constitutes and electric current which can be made to do some external work. Typically, the potential difference in a silicon solar cell is of the order of 0.5 volts, while the current produced depends on the amount of sunlight, area of the cell, etc. By connecting several cells, in series or parallel, the voltage or current output of the array can be increased. The energy is then stored in batteries. Today's batteries are rated by their ampere-hour capacity. Generally, 5, 10, or 20 hour rates have been common measures. For example, if a battery is rated at 60 amp/hours at the 20 hour rate, it means that the battery can be discharged at 3 amps for 20 hours without the voltage falling below 1.75 volts per cell, or 10.5 volts in the case of a 12-volt battery. Hans Tholstrup and Larry Perkins pioneered solar car racing when they completed an epic Solar Trek from Perth to Sydney (Australia) in 1983. What followed was a series of solar car races designed to increase public awareness. 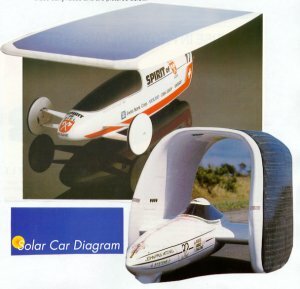 The 1987 Australian World Solar Challenge saw 23 participants inaugurate the first such race, followed by the European Tour de Sol, the American Tour de Sol, and the SUNRAYCE. Some spectacular corporate and college vehicles adorned these early races and are pictured below. The main objective of any solar car manufacturer is to build an efficient, "winning" vehicle. Design considerations included hundreds of tradeoffs, but certain elements are essential. Reliability is an important design factor. A vehicle which performed well without any major breakdowns would cover the race distance in less time. The overall shape of a solar car is another important design factor. Teams had to determine how and where they would mount the solar cells for maximum energy grain. They also had to decide how to maintain low weight and minimize aerodynamic drag. A typical solar car generates 700-1500 watts of power, or about 1-2 horsepower. This makes aerodynamic drag and rolling friction critical considerations. 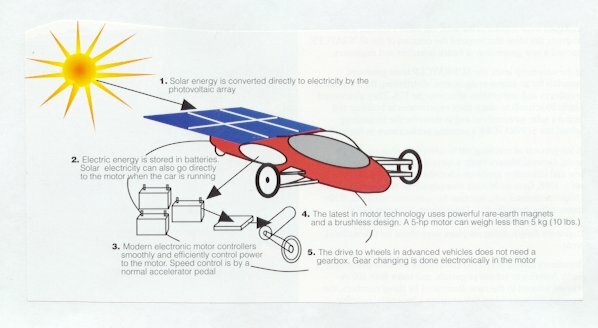 In 1993, the Winston Solar Car Team launched an education program to provide curriculum materials, on-site visits, and workshop opportunities for high schools across the country. 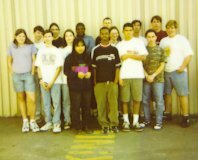 This program, originally a part of The Winston School (Dallas, TX), was designed to motivate students in the sciences, engineering, and technology. The end product of each two-year education cycle is the Solar Car Challenge: a closed-track event at the Texas Motor Speedway, or a cross country race designed to give students an opportunity to display their work. The Winston Solar Education Program has been shared with more than 900 schools in 20 countries. 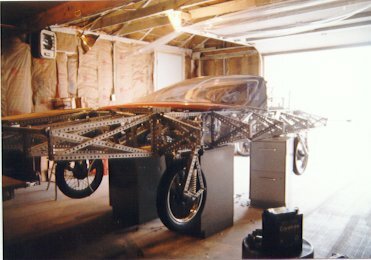 The first Challenge in 1995 attracted ninety schools leading to nine schools actually building cars for the 1995 race. Three cars qualified to run. The 1997 Challenge grew to over three hundred fifty schools in five countries. Eight cars qualified to run the 1997 race, a 600-mile cross-country event from Dallas to San Antonio. The 1999 race, a 1600 mile event from Dallas to Los Angeles, saw eight teams enjoy the fun of high school solar car racing. The 2001 race started in Round Rock, TX at Dell Computers and traveled 1400 miles to Columbus, Indiana. In 2003, ten challengers endeavored to race from Round Rock, TX to the Florida Solar Energy Center (Cocoa, FL). The challenge has grown to host 18 solar car teams in 2014 with more teams starting to build cars each year.